Tanjung Puting has no competitor. Here, you can see Orang Utan closely, you can even touch and get interaction with them. This area has already popular in all world traveling. But, there are several rules you must obey to do that. Indonesia is very rich for its biological variety especially the tropical. This was a very good capital to build business tourism. This country has two most famous species : Komodo and Orang Utan. Many foreign people get obsessed to see this two unique species. Why? Komodo was known as ancient legacy which still left in this world while Orang utan is great apes which leave outside Africa. In fact, there still one other unique species Tangkasi. But it’s hard to see. As one of orang utan’s habitat, Tanjung Puting has big potency to visited by local and foreign adventurers and this has already happen since 1970’s, but has not manage maximally yet. Compared with other orang utan habitat, Tanjung Puting has lots of superiority. 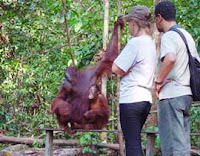 Tanjung Puting is the first place in Indonesia for orang utan’s rehabilitation. It means people guarantee can see orang utan. 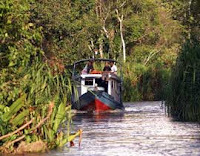 World has admit that Tanjung Puting is one of the most important area for research and has been well known by lots of people. Orang utan become a magnet conservation in this area because this area has the biggest population compare with other area in Kalimantan. This conservation has 415,040 ha wide. 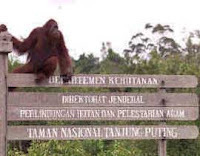 There is other orang utan conservation area at Bohorok, North Sumatera. But, the management doing mistake by built this area without concept. There are lots of concrete walls everywhere. You can’t feel the nature and can’t go for trip. Another great capital of Tanjung Puting is the free promotion by the adventure television, National Geographic. This was the only place that ever been visit by Hollywood top artist, Julia Roberts. If we take care this area carefully, orang utan could live prosperously and many tourists will come here. Tourists who come here have different characteristic with other tourist. They were people who already studying the Indonesia’s geography before leave. So, when Bali and Jakarta been bombed, they not cancel the travel. Call rate data showed from the head of Balai Taman Nasional Tanjung Puting (TNTP) in 2001 is 400 tourists. In the next year, visitors increase to 850 tourists and for 2008 data show more than 1000 tourists come here. Tanjung Puting is not only dominated by orang utan. We also can enjoy the fresh air when the light rain drop, the bright sky at noon, the shining stars at night, and of course the sunset. That’s why many people call this place as Garden of Eden.